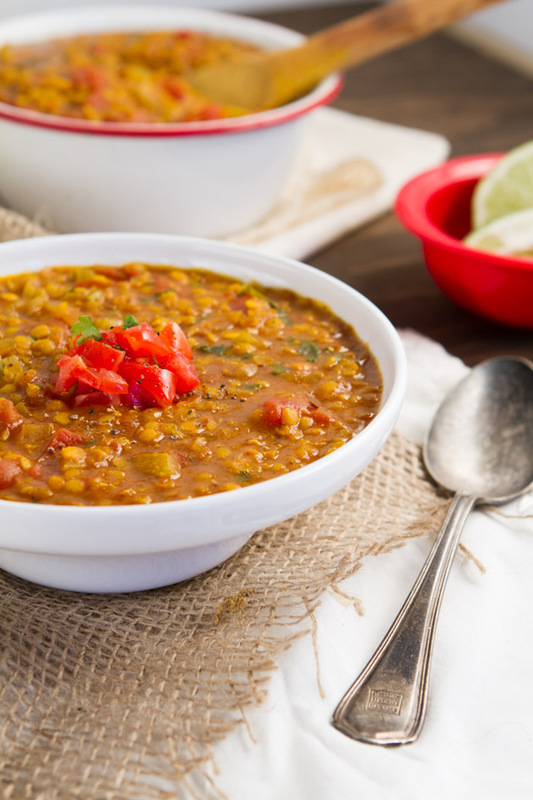 A thick and hearty lentil stew that’s low in fat and high in fiber, protein and iron. Made spicy with homemade masala and ready in under 30 minutes. Begin by sauteing oil, red onion, celery, garlic and ginger root in a medium-sized saucepan over medium-high heat for 6 minutes, until soft. Meanwhile, break apart cinnamon bark and chili’s with your fingers and place in a cast iron pan with cumin seeds. Heat on medium heat for 5 minutes, rotating often until toasted. Add toasted ingredients to the bowl of your coffee grinder. Add turmeric and saffron. Grind until smooth and set aside. Once onion mixture is complete, add remaining stew ingredients, including homemade masala. Cover, increase heat to high and bring to a boil. 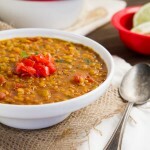 Reduce heat to low and simmer for 20 minutes, until lentils are softened. Stir in fresh cilantro and lime juice. Will keep in the fridge for 3-4 days or freeze in individual containers for quick lunches.